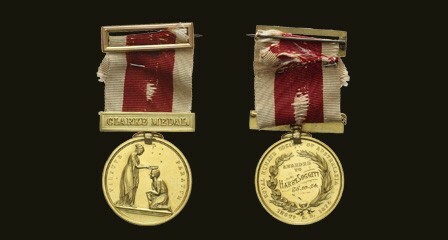 Royal Humane Society of Australasia Clarke Medal, (1934), in gold, extremely fine and rare. 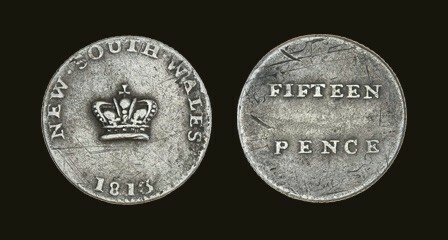 New South Wales, fifteen pence or dump, 1813 (Mira dies D/2), good very fine. 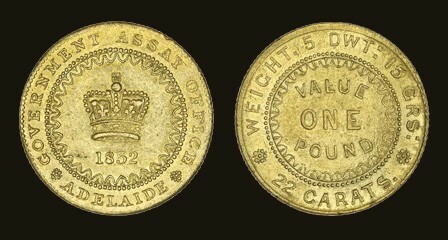 Adelaide pound, 1852, second type with crenellated inner circle on the reverse, good extremely fine or nearly uncirculated. 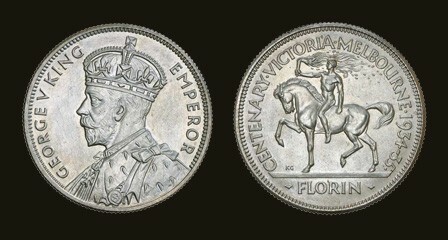 George V, 1934-35 Melbourne Centenary, virtually FDC and extremely rare as such, the finest we have seen and handled. 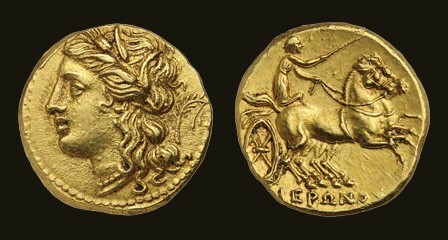 Ancient British, North Eastern Region, Corieltavi, Dumnocoveros Tigirseno type, (c.25-35 A.D.), gold stater, good very fine and rare. Sicily, Syracuse, Hieron II (275-215 B.C. ), gold sixty litrai - dekadrachm (4.29 g), extremely fine. 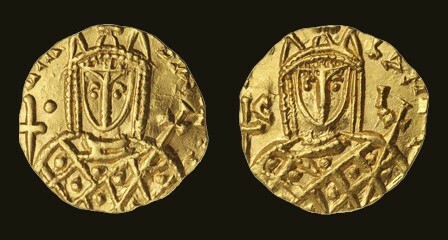 Byzantine, Irene, (797-802), gold solidus, Syracuse mint, (3.83 g), mint state and extremely rare. USA, large cent, 1793, flowing hair Liberty, chain reverse, America, nearly very fine/good very fine and very rare in this condition. Germany, Hannover, Wallmoden-Gimborn, Johann Ludwig, ducat, 1802, nearly uncirculated and very rare, only 400 struck. 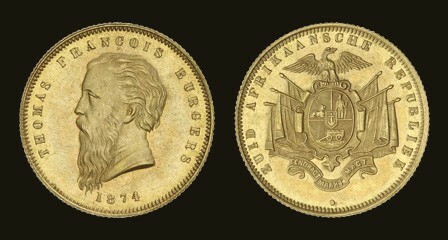 South Africa, ZAR, Thomas Francois Burgers, one pond, 1874, proof-like, nearly FDC and very rare, one of the finest known. 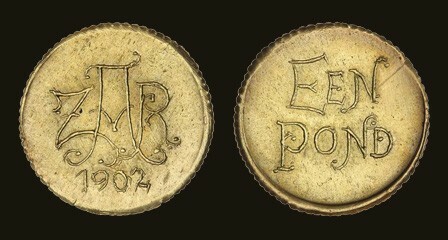 South Africa, ZAR, one pond, 1902, 'Veld Pond' during Boer War siege, good extremely fine and very rare. 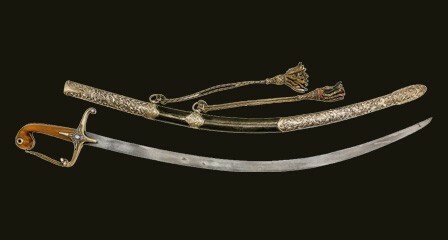 Ottoman Empire, c1840, shamshir style sword presented to Admiral Sir Charles Napier by the Sultan of Turkey, Abdulmejid I, very fine. 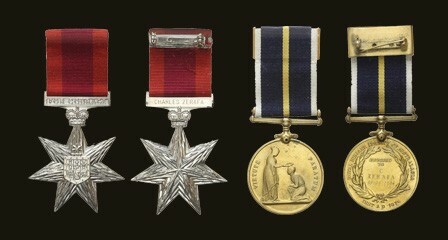 Bravery awards to a Tasmanian: Star of Courage; Royal Humane Society of Australasia Gold Medal, uncirculated. 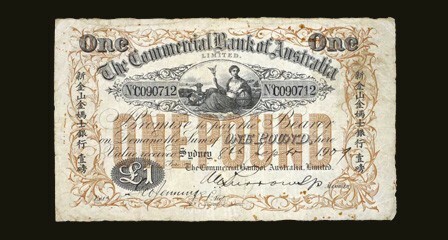 The Commercial Bank of Australia, one pound, Sydney, 8th Septr. 1909, No C 090712 (MVR 1), , nearly very fine and extremely rare. 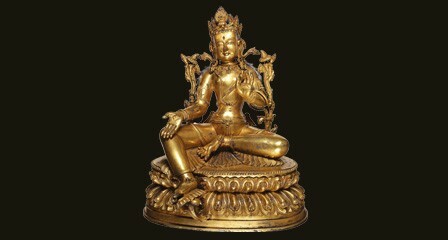 China, late 19th - early 20th century, gilt bronze Sino Tibetan Bodhisattva, extremely fine and rare. Catalogue available online, sale results published during and following auction. download our subscription form (pdf). Bid online or submit absentee bids (pdf) by fax or post. Bids must be received 24 hours prior to auction session commencement. This auction was well supported by live in the room bidders as well as online bidders. The total clearance of lots was nearly 90 percent by volume at 117 percent of estimate. There were 600 different buyers out of over 3,000 who registered to bid. 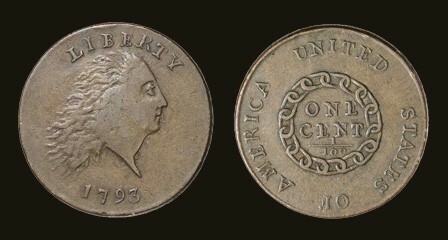 Highest price for the sale went to the US Chain America cent. 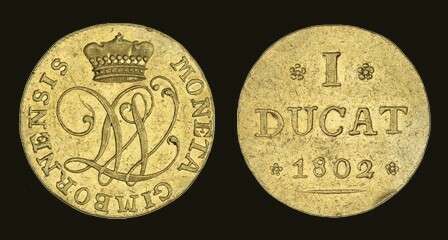 This sale was a great success, particularly for world gold coins, Indian coins, British gold coins, and world banknotes. The total $3.7 million was taken up by 550 buyers from the 5,000 who registered for this sale. The total clearance of lots was 85%; by value of lots sold against their estimate, it was at 116%. Welcome to our first auction for 2019. Once again there are a wide range of coins, banknotes, medals and related items on offer from many vendors including several deceased estates. Welcome to our third and final auction for the year 2018, offering a wide range of items from many collectors both past and present. 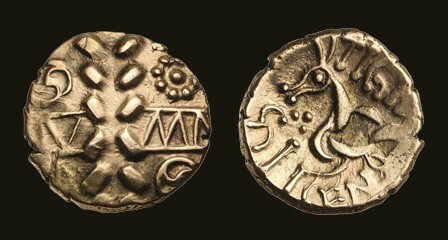 An example of such is the offering of Indian coins, which take up the whole of the twelfth session and mostly come from the Dr V.J.A. Flynn Collection. Stay informed with the latest auction news and featured items. Coins, medals and banknotes wanted for our next major auction. Free, confidential auction valuations.